So back to the great day we had today… I went to Sunrose to do my normal semi-daily check of the system and to also clean out some of the fallen leaves (a definite drawback to being under these large shade trees…) What growth there has been in only TEN DAYS!!!! The photo on the left is a small Heirloom Chocolate Cherry tomato that was purchased as a transplant from Home Depot. 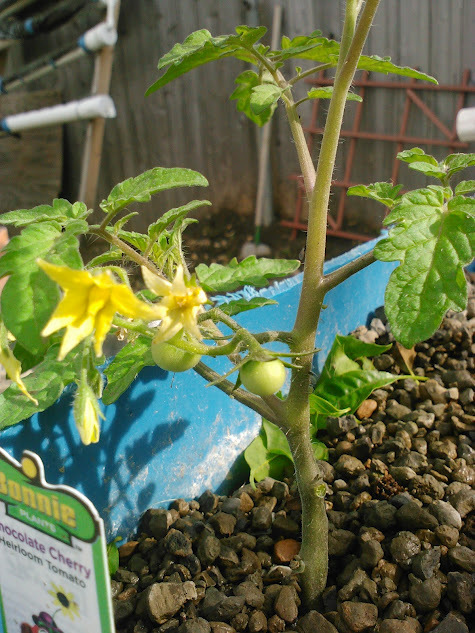 As you can see in the photos, we already have two small tomatoes and about 5 to 7 flowers in various stages of development. 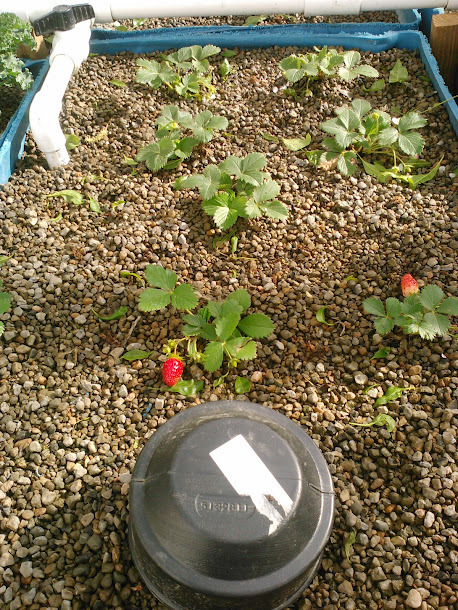 In the photo on the right, there are some beautiful Quinalt strawberries. Actually there are 8 plants in the bed currently, but I think I am going to add another four. There are two ripe berries, though (in the spirit of full disclosure) I will admit that those two ripe strawberries were on the plants as green berries when we put them in. BUT, the FOURTEEN (at least) new berries were not!